South Gloucestershire Youth Wind Orchestra was presented with the Music for Youth National Partnership Award for Wind Bands, which was donated by the Royal Marines Band Service. Students picked up the award during a special reception event at the prestigious London venue. They clinched the title following a performance at a Music for Youth Festival in Birmingham over the summer. Pictured: Conductor David Pagett (left), Amy Holden and Ben Haslam receiving their award from Warrant Officer Neville Dednum of the Royal Marines Band Service. Amy Holden, a pupil at Chipping Sodbury Secondary School and Ben Haslam, a former student at Abbeywood Community School who now studies in Bristol were on hand to collect the award. The group are due to travel to Portsmouth to meet professional musicians from the Band of the Royal Marines. 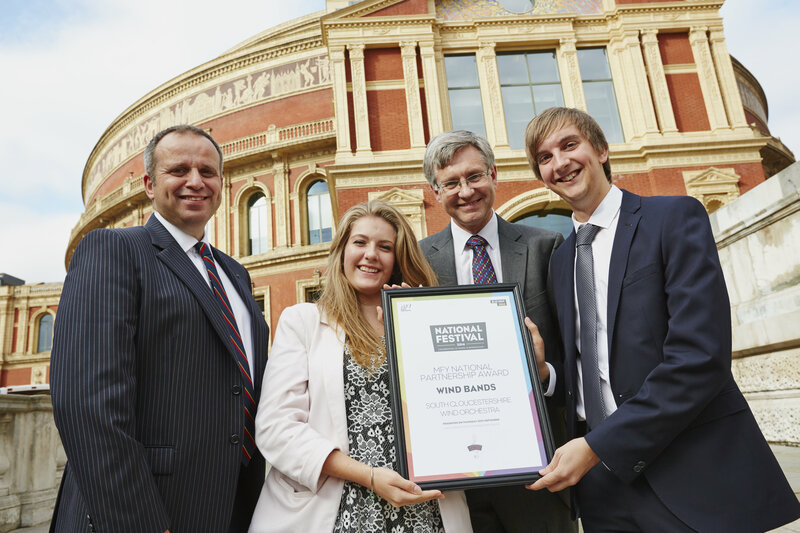 Richard Jones, Music and Arts Strategy Manager at South Gloucestershire Council, said: “The achievement of our wind orchestra at the National Festival of Music for Youth is testament to the rising standards we hear at our music centres in South Gloucestershire.